Typing on today's mobile phones and tablets is needlessly slow. One limitation is that the QWERTY layout is ill-suited for tablets and other touchscreen devices when typing with the thumbs. Two-thumb typing is ergonomically very different from typing on a physical keyboard. It has been established that normal users using a QWERTY on a touchscreen device are limited to typing at a rate of around 20 words per minute, which is slow compared to the rates achieved on physical keyboards. 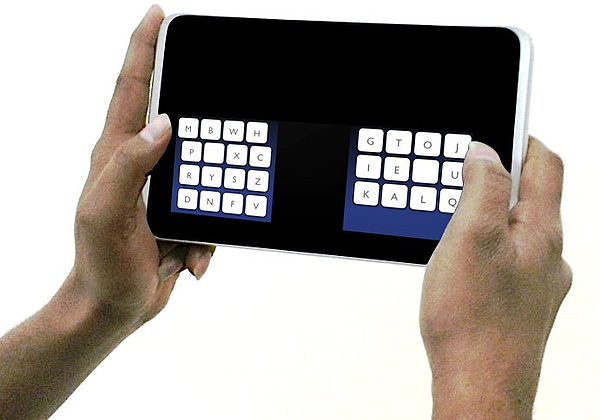 The researchers set out to create an alternative to QWERTY that offers substantial performance advantages for users. The researchers incorporated models of thumb movement into a computational optimization algorithm. The researchers from the Max Planck Institute for Informatics and colleagues from the University of St Andrews and Montana Tech quickly realized that slight changes to the layout, like exchanging a few keys, would not be sufficient for a significant improvement. Words like "on, see, you, read, dear, immune, based", frequently used in texts, have to be typed on a split-QWERTY layout with a single thumb only, making the typing burdensome. This initiated the process to develop a layout for two-thumb text entry with the goal of improving typing performance and minimizing the strain for the thumbs. Antti Oulasvirta says "The key to optimizing a keyboard for two thumbs is to minimize long sequences with a single thumb. We also want to place frequently used letters centrally close to each other. Experienced typists move their thumbs simultaneously: While one is typing, the other is approaching its next target. We derived a predictive model of this behaviour for the optimization method." The computational optimization process had two goals: To minimize the moving time of the thumbs and to approximate alternating sides as well as possible. The result achieved by computational optimization was rather unexpected. In the new keyboard KALQ, all vowels, with the exception of the letter "y", are placed in the area for the right thumb, whereas the left thumb gets assigned more keys. To fully benefit from this layout, the users were trained to move their thumbs simultaneously. While one thumb is typing, the other one can move to its next target. Per Ola Kristensson says "The legacy of QWERTY has trapped users with suboptimal text entry interfaces on mobile devices. However, before abandoning QWERTY, users rightfully demand a compelling alternative. We believe KALQ provides a large enough performance improvement to give users the incentive to switch and benefit from faster and more comfortable typing." Finally, the authors developed probabilistic error correction methods that took into account how thumbs move and also statistical knowledge about the texts users type. Their error correction method enabled trained users to type more quickly while retaining an acceptable level of errors. With these improvements, users were able to reach 37 words per minute, which is the best ever reported for two-thumb typing on touchscreen devices, significantly more than the approximate 20 words on a split QWERTY that regular users can achieve. The researchers will present their work at the CHI 2013 conference in Paris on May 1st. CHI is the principal international forum for outstanding research and development in human-computer interaction. The Max Planck Institute for Informatics is just one of several institutes on Saarland University's campus devoted to research in computer science. In the direct vicinity are also located: the De-partment of Computer Science of Saarland University, the Max Planck Institute for Software Sys-tems, the Center for Bioinformatics, the Center for IT-Security, Privacy and Accountability, the recently renewed Cluster of Excellence "Multimodal Computing and Interaction", the German Research Center for Artificial Intelligence (DFKI), and the Intel Visual Computing Institute.